We're continuing our look into how the United States has interacted with the state of Israel since it became a nation in 1948, and what the Bible say about our future relationship. We'll continue by taking a look at the history of our relationship, considering further U.S. Administrations. 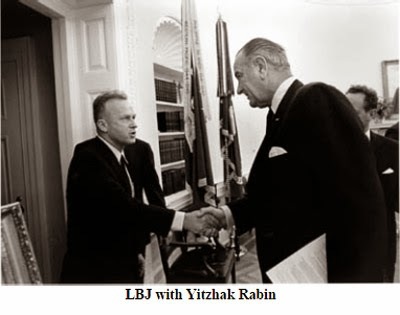 Lyndon Johnson quickly emerged as one of the greatest friends of Israel among modern day presidents — so much so that he has often been referred to as "America's first Jewish President. "19 Soon after taking office in the aftermath of John F. Kennedy's assassination in 1963, Johnson told an Israeli diplomat, "You have lost a very great friend, but you have found a better one. "20 During his administration, the U.S. became Israel's chief diplomatic ally and primary arms supplier. In the third part of this series on the historical relations between the USA and Israel, we'll see how other presidents handled or mishandled Israel. 19) Lenny Ben-David, "Our First Jewish President Lyndon Johnson?" 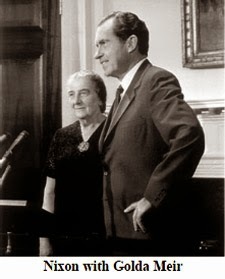 http://5tjt.com/our-first-jewish-president-lyndon- johnsonan-update. 20) Donald Neff, "Lyndon Johnson Was First to Align U.S. Policy With Israel's Policies," http://www.wrmea.org/1996-novemberdecember/middle-east-history-it-happened-in-november.html, page 1. 21) Lenny Ben-David, "Our First Jewish President Lyndon Johnson?" pages 2-3. 22) Jason Maoz, "Lyndon Johnson, Friend of the Jews," Commentary magazine, August 22, 2008, www.commentarymagazine.com/2008/08/22/lyndon-johnson-friend-of-the-jews, page 2. Much of the information about Johnson's pro-Jewish activity in his early years has been gleaned by scholars from an unpublished 1989 doctoral dissertation at the University of Texas by Louis Gomolak entitled, "Prologue: LBJ's Foreign Affairs Background, 1908 - 1948." 23) Lenny Ben-David, "Our First Jewish President Lyndon Johnson?" page 2. 27) Jim Byron, "How Richard Nixon Saved Israel," http://blog.nixon foundation.org/2010/10/how-richard-nixon-saved-israel, page 1. 28) Mitchell Bard, "Arab-Israeli Conflict #5 - Yom Kippur War," www.aish.com/jw/me/48893552.html, page 4. 29) Roger Stone, "How Nixon Saved the State of Israel," www.lewrockwell.com/2014/08/roger-stone/nixon-on-jews-and-israel. 30) Jerry Klinger, "Richard Nixon - Henry Kissinger: The Anti- Semite Who Saved Israel," http://www.jewishmag.com/167mag/kissinger-nixon-war-watergate/kissinger-nixon-war-watergate.htm, page 16. 31) Haartz, "Gerald Ford, the U.S. president who reassessed policy toward Israel, dies at 93," December 28, 2006, page 2. 32) Christa Case Bryant, "Netanyahu-Obama tensions nothing new: 5 low points in US-Israel ties," Christian Science Monitor, September 27, 2012, http://www.unitedjerusalem.org/ ndex2.aspid=1612216&Date=10/17/2012, page 2. 33) Bernard Gwertzman, "Egypt and Israel Sign Formal Treaty, Ending a State of War After 30 Years; Sadat and Begin Praise Carter's Role," The New York Times, March 26, 1979. 34) The Miller Center of the University of Virginia, "American President: Jimmy Carter," http://millercenter.org/president/carter/essays/biography/5, page 3. 36) Jennifer Pompi, "Jimmy Carter slams Israel in pro-Palestine op-ed," The Washington Times, August 5, 2014, http://www.washingtontimes.com/news/2014/aug/5/jimmy-carter-slamsisrael-in-pro-palestine-op-ed.